* The parts in the ( ) is the optional item, not included or used in the unit, but you could choose to use or replace the original item with the one in ( ). 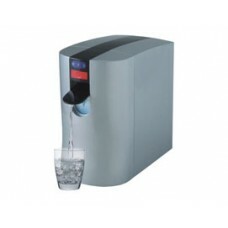 ●When placed on the countertop, it can act just like a water dispenser! (No HOT or COLD feature) Just push down the button, as the picture shown. ●Elegantly designed for convenient portability! Everything you need is inside of this case! P.S: Also easy for cleaning! ●NO MORE SPANNER WRENCH!! Easy filter replacements!! ●Space saving? Yes! The HY-5088 combines the RO system and its tank! Also, bugs can't get in!